Early modern writers repeatedly return to the analogy between family and politics most famously articulated here by James I. The idea that political hierarchies and identities might usefully be evoked within discourses of the family is almost ubiquitous in the period, in which the metaphor is deployed in a wide variety of contexts and genres. In conduct literature, for example, it was common to present the family as ‘a little commonwealth’: ‘[a]s every mans house is his Castle, so is his family a private Common-wealth, wherein if due government be not observed, nothing but confusion is to be expected’.2 Conversely, marriage, maternity, sibling and other familial bonds (including those of master and servants within the household) served important symbolic functions in the political discourse of early modern England. Amongst the best known of these figurations was pater patriae, the image of the king as father to his subjects. As James VI and I writes in The true lawe of free monarchies, &c., first published in Scotland in 1598 and reissued by London presses on his assumption of the English throne in 1603, ‘fatherly duty’ motivates the ‘care’ of a monarch for his people, who are in turn figured as ‘children’ subject to his ‘vertuous gouernment’. However, as the chapters in this collection will show, and as we will begin to suggest in this introduction, such analogies are not straightforward. Early modern writers are interested in subverting and questioning the power of such metaphors, as much as they are in using them, and the subtle distinctions between these differing kinds of familial-political figures need to be carefully scrutinised if we are to fully understand how they functioned at this moment in England’s literary history. 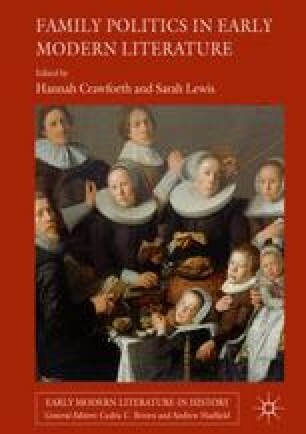 This collection reveals the complexities behind this seemingly simple motif and explores the nuances that reside in literary treatments of the family as a political unit and of politics as something that can be imagined by recourse to the hierarchical relationships that structure the early modern family.